FOR ALL THESE WEEKS, EARLY BOOKING IS ESSENTIAL AS THEY FILL SO FAST. ‘More’ group TUESDAY 28th April – TUESDAY 5th May 2020. Women only. These groups are capped at a maximum of 14. This group is for returners and newcomers alike and is more divergent in participants’ writing interests and experience, with more of a mix of poetry and prose. JUST A FEW PLACES LEFT FOR 2020 AS OF APRIL 2019. Each week is 6 days, 7 nights. My new collection of poems from the many years I’ve visited Iona, A Trick of the Light, is available from the link, or from me. An island is both a physical point in space and metaphorically a place where we might bring ourselves home. 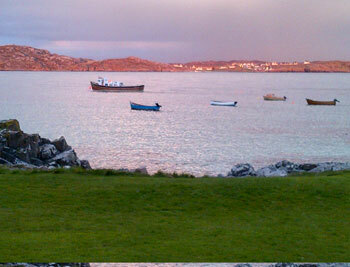 Iona is one of those places where, as the Celts describe it, the veil between ‘this’ world and the Otherworld is thin. Now seen as remote, once Iona would have been at the heart of Atlantic seafaring peoples’ voyages, and has probably been a place of pilgrimage for 1000s of years. It was supposedly a Druidic teaching centre before the arrival of Celtic Christianity. All of this is palpable on this little speck of dust in the vast Atlantic ocean which draws to it many thousands of people from all over the world each year. Here, surrounded by the seas that both connect us and keep us apart, is a good place to start the quest for the heart. We are brought here, somehow, with some kind of deep longing, or yearning, often for we know not what; ‘hiraeth’, the Welsh call it; ‘cianalas’ in Scottish Gaelic. We come, whether or not it’s intentional, in a kind of spirit of pilgrimage. For nine years from 2001 I led a weeklong retreat on Iona with my friend, fellow author and poet Kenneth Steven. The many people who have attended (from five continents and many countries), some of whom return every year, know what a unique, creative, therapeutic and frequently life-changing experience these days offer. In 2009 I launched the Iona event as a solo adventure for me. I changed the name from ‘Into Blue Silence’ to ‘Islands of the Heart*’, but kept the spirit of our shared venture: the ambience and format; the wonderful Argyll Hotel, right on the water; the walks; the warm gatherings; the workshops, discussions, talks, poems and readings; the daylong pilgrimage to St Columba’s Bay gathering silence, green stones, and the voices of the air; looking for seals; the boat trip to Staffa (weather permitting). The green stones, Iona serpentine, have assumed mythical and talismanic proportions. Iona is and always has been a place to bring your stories and poems, your joys and sorrows, dreams and memories, longings and search for belonging, your laughter and your open heart. Central to these weeks is the deepening of the connection between inner and outer landscapes, remembering the ancient and abiding web of relationship that holds us all. Being present in the continually-moving unfolding of the stories of earth, sea, sky, the edges between them, and the many other species with whom we share this island – and planet – helps to inspire memory, tales, poetry and a profound sense of interconnectedness. Inevitably, we will become more aware of how we live our lives and what really matters; many people find this process both exhilarating and healing. This is more than ‘simply’ a creative writing retreat. You probably won’t finish – or even start – your novel. You will, however, probably go home with a full notebook and many ideas that will continue to unfold over months. You will likely also go home with an indefinable but profound sense of uplift and deep nurturing. 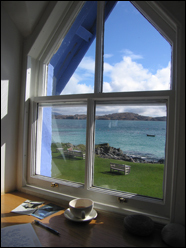 We use writing as a means of creative expression, but also as reflective practice, for the imaginal and experiential exploring of our edges, for self-knowledge and awareness of our interrelationships with each other, with sea, land (Iona’s bedrock is some of the oldest on the planet), wildlife, the elements, soul and the numinous. We work both indoors and out-. Also, some walking is an integral part of the course; some sessions are built around a walk. So the week is holistic and intensive and we work at some depth. People often find the week to be deeply transformative and healing as well as richly creative, but it can also be quite emotionally demanding: the island has a way of first ‘scouring’ you, then offering deep restoration of the heart. The groups are invariably warm, trusting and supportive. The group cohesion, dynamic and process depend on a commitment to attending all the morning and evening sessions (see SMALL PRINT 2 below). Put off yet? If not, you might want to scroll down for all the practical info. There’s also some of the recent feedback; there’s more here. The first thing is PLEASE BE SURE TO BOOK WITH ME FIRST, or you may find that you’ve a room on the island but no course to go to, as the places are reserved very quickly! THEN find your room: the Argyll Hotel holds rooms as a block booking for me so on the website it might say ‘full’, but telephone or email them (FAO Katy) and say you’re attending my course. If you possibly can, stay in the hotel – it makes a big difference to your experience of the course. The local B&B Ardoran House comes well-recommended if the Argyll is full (5 minutes’ walk). The St Columba Hotel is 5 minutes’ walk away. Of course, nothing will beat the Argyll Hotel. The rate includes a generous breakfast. Bear in mind that you’ll cut the room cost in half if you share with another participant, friend or partner. The lovely owners are willing to negotiate timing of payments. The staff will tell you about it all (Katy usually deals with room bookings for my course). See http://www.argyllhoteliona.co.uk and under their ‘essentials’ button you’ll find a link to other island accommodation. We’ll be at the Argyll for all the indoor sessions (morning, late afternoon, and evening) and we all share dinner at the hotel, as a group. We think you can eat well, on the fine imaginative, mostly locally-grown and as much as possible organic Argyll fare, for between £13 & £25 per day (including simple lunch but excluding drinks and desserts), assuming you have breakfast wherever you’re staying (that’s included in the rate at the Argyll). Frugal people can of course probably improve on that! The hotel is adept at catering for vegan and gluten-free diets as well as fish- and meat-eaters. There are plenty of other island options for lunches, in addition to the Argyll. By the way, you don’t need to book a table for dinner, as it says on the Argyll’s website, if you’re coming on the course – I do a block booking. This is in two parts: my fee, and the accommodation. My fee for 2020 is £395. NB I will pencil your name in but will not take this as a firm booking until you’ve paid a deposit of £200. A deposit is required with your booking, with the balance due by 31st January 2020 (instalments possible) for the spring 2020 groups; by June 30th 2019 (ditto) for September 2019, but see below; your booking is taken as agreement to the terms and conditions in ‘the small print’. If you haven’t worked with me before, on applying please tell me just a little about yourself and why you want to join us. The work goes deep, and the group dynamic depends on creating a safe and trusting ambience very quickly, so it helps to know a little about the participants. Prices do not include the optional boat trip to Staffa (‘Staffa Trips’ on Iolaire), which is around £35 – and it’s more than worth it. You will probably see seals, and you may see puffins. Sometimes there are dolphins; always many seabirds. Our skipper is very knowledgeable about the history, prehistory, wildlife and general natural history and geology etc. You will need to make your own travel arrangements: see below. It’s advisable to book this and your accommodation asap, as the course fills fast and I often turn people away. I keep my own fee as low as I can, but I also need to book the hotel so am myself committed and ask that you too commit if I hold you a place. Please note that if for any reason I cancel the course, your fee is fully refundable. The last few years this course has consistently had a waiting list over and above the 14 (maximum) participants I can accommodate. I know that life can sometimes get in the way of the best plans, but despite a waiting list late cancellations can make it hard to refill your place. If you cancel before January 31st for spring, June 30th for September, your deposit is refundable minus £50 admin and/or readvertising time and costs IF I CAN FILL YOUR PLACE. After that refunds are not possible. You might want to consider travel insurance. Please also note that the course fee, if you cancel, is not transferable. Your booking is taken as acceptance of this and also the content of Small print 2, below; and also of the fact that if you sustain any kind of accident or injury while on the course you accept liability for it (though I and we will of course will take all reasonable precautions to prevent it). See also here. Also you need to know, especially if you’re staying any distance away from the Argyll, that this is a structured retreat, and because of the high levels of trust and intimacy we create, it’s important that you plan to attend both morning and evening sessions, including dinner in the hotel (obviously emergencies excepted). Afternoon sharing-work sessions, and any trips out (other than to St Columba’s Bay midweek), e.g. to Staffa, are optional, so if you like space and downtime in between sessions, the afternoons can accommodate that need for free time. The course now is six days, seven nights, and starts with dinner at 7pm and a brief introductory session on the Saturday (groups 1 & 3), Tuesday (group 2) evenings, and participants leave after breakfast on the following Saturday/Tuesday, after our final celebration the evening before. You do need to attend the whole course. Note that the last ferry from Mull to Iona is just after 6pm usually at this time of year; please check with Caledonian MacBrayne times of crossings from Oban to Craignure on Mull in order to take the bus to get you to the Iona ferry at Fionnphort in time for the evening opening. Usually you can assume that if you get the 4pm ferry from Oban to Mull (Craignure), and catch the bus, you’ll make that last ferry, just. Better to catch the 12 noon or 2pm sailing, but do check bus timetables on the Calmac site or with West Coast Motors coach company detailed on the Calmac site. There should be a bus to meet some of those Oban ferries, and to get you to Fionnphort in time for the last Iona crossing, and they generally wait for each other (within reason). NB if you’re staying anywhere other than the Argyll you will need to arrive earlier, as there won’t be time to get there and back before the evening gathering if you come on the last ferry. Flights or trains to Glasgow (I personally recommend the train whenever possible for two reasons: one, the environmental – walking lightly on this earth is part of the ethos of Fire in the Head; and two, the spirit of pilgrimage is best honoured by including time for the soul to keep up with the body). Then take the West Highland Line to Oban (beware that the train often splits at Crianlarich for Fort William!). I like to do this in daylight because travelling along Loch Lomond and past the castle ruins on Loch Awe is a treat. There is then the ferry sailing to Craignure on Mull (Caledonian MacBrayne, or ‘Calmac’, as above); a bus journey (the buses normally tie in with the ferries) across Mull to Fionnphort; finally the ten-minute ferry crossing to Iona. The Argyll Hotel is visible in front of you to the right. In April we’ve usually been lucky with the weather: mostly fine bright days (and 24 hours of dramatic and rare snow in 2016). But it can be chilly; there’s often a wind, and we have to allow for stormy weather. We do quite a lot of walking, too, so warm clothing, waterproofs, windproofs, gloves and scarves and walking boots are musts. The September course is an unknown quantity; we’ll be discovering together. The bedrock of the weeks is, loosely, poetry, with elements of creative prose-writing, memoir, reflection, journalling and experiential writing. However, Group 1 consists of experienced poets and poetry is very much our focus; Group 2 and Group 3 are more general. None of the weeks is about being ‘good at’ something, but about exploring words, their possibilities for connection, their richness and their edges. 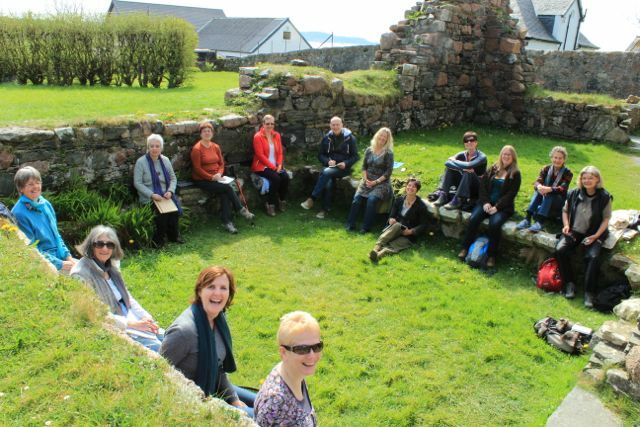 There’s a lovely article on Iona by writer Linda Cracknell here. A ‘newbie’ on group 2 writes here about her experience in 2017. And because things sometimes don’t work out according to plan, you might be interested in 2018 participant Susan Jordan’s experience here (plus the preceding 2 posts). A participant in 2014 wrote a blog about it here. And finally: you can find out more about Kenneth Steven, who co-founded this retreat week with me way back when, and still offers a week with a Celtic Christianity emphasis on the island, and his books here. There is a great deal of feedback on the Iona groups. Here’s some; there’s more, & more recent, testimonials on the ‘What They Say’ page. You’ll find more, plus other general course feedback here. YOU MAY HAVE SEEN THE NAME ‘ISLANDS OF THE HEART’ AS A CHAPTER TITLE IN RELATION TO IONA IN A RECENT BOOK. AS FAR AS I KNOW, THE PHRASE ‘ISLANDS OF THE HEART’ IS MY CREATION. THIS, ALONG WITH OTHER IDEAS FROM MY WORK IN THE SAME BOOK, WAS ‘BORROWED’ WITHOUT MY PERMISSION, AND HAS CAUSED SOME CONFUSION IN WOULD-BE PARTICIPANTS. THIS COURSE, NEARLY 20 YEARS OLD, HAS NOTHING WHATEVER TO DO WITH THE AUTHOR OF SAID BOOK, AND NEVER HAD.